When you look in the mirror, are you satisfied with your smile? Does it have gaps, stains, or crooked teeth? If you want that movie-star grin, dental veneers may be the ideal option for you! Veneers are durable, beautiful, and used by superstars and layman alike. A beautiful smile can be yours with veneers from White Mountain Dental! Veneers are thin shells made of durable, stain-resistant, dental-grade porcelain that are placed over your teeth. 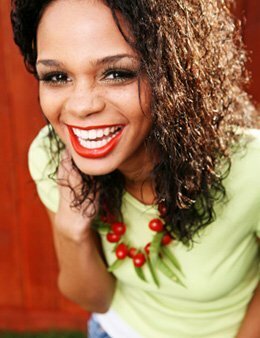 Veneers make teeth look whiter, straighter, and more even. They can be used for single-tooth repairs or even a full-smile makeover! With proper care, veneers can last for years, bringing you the smile of your dreams. When placing veneers, the first step is to take impressions of your teeth. At our office, we have an intraoral scanner that replaces the use of traditional molds. This scanner uses a wand to map the inside of your mouth. The scans are digital, making them more accurate than traditional molds and easy to create. Using these scans is also quite efficient as we can send them to the laboratory instantly. A laboratory produces the veneers according to the shapes of your teeth. Once the veneers are ready, your teeth are prepared for the placement process. A dental-grade cement is applied to your teeth before placement; the cement is then hardened using a beam of light. Veneers are a non-reversible option to improving your smile. They provide an excellent aesthetic for your smile. They are stain-resistant, as well. However, you may be advised to avoid drinks that stain teeth, such as coffee or red wine. You will also need to maintain good oral hygiene by brushing, flossing, and attending regular dental visits. With care, dental veneers can give you a brilliant smile worthy of the red carpet. Call our office if you would like to see how veneers can help you!